Samaritan’s Purse volunteers are sharing the Gospel and constructing a new building for the Nunapitchuk Moravian Church. “It’s not crispy enough.” Sophia can still hear her father saying those words as she reflects back to the days when she learned to prepare smoked fish as a child. Sophia Larson works hard to store meat for winter. Though Sophia Larson’s dad passed away 17 years ago, she fondly remembers his gentle critique and those times spent in her parent’s smokehouse—her father serving as chief taste tester. Sophia lives in Nunapitchuk, a quiet Alaskan village unchanged by modern conveniences and life’s accelerated pace. “Main Street” is a post office, small hardware store, and general store with basic necessities. It’s where the 63-year-old mother raised five children and is now raising her grandchildren to understand the ins and outs of fishing. In this remote part of western Alaska on the banks of the Johnson River, fishing isn’t a hobby for Sophia—it’s survival. Nunapitchuk is without roads and the widest boardwalks barely accommodate all-terrain vehicles, the popular form of transportation. The village is only accessible by boat and plane, or snowmobile during winter when the river is frozen. Children in Nunapitchuk enjoy playing outside and riding their bicycles. Providing for a family is an arduous responsibility in this Yupik village that sits on a vast, swampy tundra. Yupik rely on subsistence fishing and hunting, and labor hard to store food for winter. The tundra’s shifting and sinking permafrost is a muddy mess that can have brutal consequences for homes and buildings in Sophia’s village. The squish is everywhere. Venturing off boardwalks means slogging through boggy, spongy soil. Last summer, the frost heave finally became too much for the Moravian church building, which fell off its foundation and collapsed. Samaritan’s Purse is working in Jesus’ Name to construct a new building for Sophia’s church, the Nunapitchuk Moravian Church. We’re forming relationships and sharing the Gospel in a community that has felt forgotten and without hope. Donning her “fish clothes”—a baggy green hooded sweatshirt, sweatpants, and rubber boots— Sophia works hard cleaning and preparing her fish. The smoked fish is eaten like fish jerky. She’ll freeze some meat for wintertime cooking and the rest goes into the smokehouse until it’s nice and crispy—just as her dad liked it. Sophia is 63 years old and has raised five children in Nunapitchuk. She prays that more people in her village will hear the Gospel and come to faith in Jesus Christ. Her dad was an elder in the Nunapitchuk Moravian Church and also served as a lay pastor for a number of churches, including the Nunapitchuk church. “He was never still. Even the year he passed away he was active in the church,” Sophia said. Sophia became a Christian around age 12. Her parents raised her and her 10 siblings in a home that cherished the Gospel. Some of her siblings still live in Nunapitchuk, including her older brother who takes Sophia fishing on his boat. Sophia’s parents raised their children to value their Yupik culture. They taught them how to fish, hunt, and pick salmon berries. They made sure they knew the Yupik language. They also taught them to take care of one another, which is especially valued in Nunapitchuk where family clans have lived for generations. Sophia made her home in Nunapitchuk because she is able to do activities enjoyable to her, such as fishing and teaching in the preschool, where she has worked for a number of years. Yet, life is still hard in remote Alaska, especially with alcohol’s increased influence. Samaritan’s Purse Nunapitchuk program manager Andy Beauchamp and church member Morris Alexie. Morris and other village residents are working alongside volunteers to rebuild the church and encourage the community. “It touches the whole village. Even people who are not drinking have family members who are,” Sophia explained. Job scarcity also makes Nunapitchuk a tough place to settle. “A lot of young adults move away because they can’t find jobs here,” Sophia said. Sophia has long been burdened for the village she’s come to love because many people do not have a personal relationship with Jesus Christ. She said church attendance has dwindled over the years and people have lost interest in God. Sometimes Sophia is lonely without regular fellowship with other believers. She’s praying that the Gospel witness of Samaritan’s Purse volunteers will help move hearts closer toward God. James Berlin Sr. is an elder in the church and shares Sophia’s devotion to Nunapitchuk. Like Sophia, he’s hopeful that excitement from the new construction will spark a renewed interest throughout the village in attending church and growing in faith in Jesus Christ. James is 73 years old and has six children and 20 grandchildren, most of whom live down the street, across the street, or next door. James said that family is priority among Yupik. “We were brought up in our culture to help each other, especially in time of need,” he said. James Berlin has served as an elder in the Moravian church for many years. James is thankful Samaritan’s Purse came to Nunapitchuk during a critical time—a time when James and the church members had no idea how they would construct a new church building on their own. Talking about God’s faithfulness in bringing Samaritan’s Purse volunteers to remote Nunapitchuk overwhelms James with gratitude. Even the harsh Alaskan wilderness allows for tears and tender moments. A tenderness that comes from within the hearts of those who love the village they call home and pray that the best days are just over the horizon. 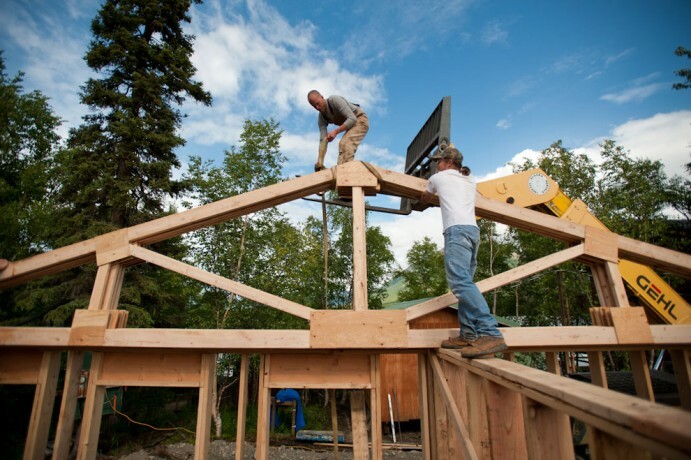 Alaska Projects Samaritan’s Purse staff and ministry partners aim to bring practical help and the Good News of Jesus Christ to native peoples in Alaska and the surrounding region.